Online video interviews are becoming more and more common. Before you have one, prepare a little, and make sure you come out ahead. 1. Try out your webcam and your video call software in advance. Practice calling a patient friend if you've never used the software before. For the webcam, let it run in a window while you adjust settings and surroundings and get used to speaking to the camera. - Get the height and distance right (see photo). Arrange it so your head and shoulders are in the frame, and so the camera isn't much above or below you. Your interviewer doesn't need a close-up of your forehead. 2. Choose a neutral, uncluttered background. No matter how good you look, if the background looks bad, it will reflect poorly on you. If anything but a plain wall must be in the frame, make sure that it looks tidy and appropriate. Move your camera or computer as needed to avoid showing off that poster of your favorite rock band. - Close the door and remove or turn off your phone. - Arrange for a babysitter if you need one, and put out the dog or cat if you'll be interviewing at home. - Close windows to eliminate background noises if your neighborhood has lots of traffic, barking dogs, etc. 4. Adjust the lighting. You want neither too little (you will appear dark and yellow) nor too much (pale and washed-out blue or white). You may need to open or close blinds and turn lights on or off. Try to have the light coming from behind the camera, but in front of or just to the side of you. - Your camera or software may have settings to adjust if the lighting is not optimal. 5.Check the sound. Do you have a headset microphone? Is it working? Will you be wearing it? Does it have a mute button? Try recording a bit of your voice and find out how you sound. - Adjust the microphone volume, if you have the choice, to a comfortable, medium level. - If you hear a lot of air from PS and t's puffing into the microphone, try moving it just to the side of your mouth. 6. Wear clothes that are comfortable but suited to an interview. Try on your intended outfit and let the camera run, so you can see if anything looks strange. - Although it may be tempting to interview in a blazer, dress shirt, and shorts, think twice about leaving out the bottom half of your wardrobe. You might have to get up to go get something (in which case the interviewer might see your legs). Being fully dressed, including shoes, may also come across in your voice and manner. - Don't wear busy prints. Avoid anything bright, checked, striped or with a herringbone pattern. Such patterns could transmit strangely and cause a distraction. - Don't wear bright white for a shirt or blouse. It will overpower the screen and your appearance. 7. Be aware of what glasses will do. There might be reflection off of them, but if you need them, go ahead and wear them. Try putting the light off to one side if you see a lot of reflection or glare. 8. Consider powdering your face. Even if you're a guy, light can reflect off of the oils on your face, so add some light translucent powder. If you're wearing any other makeup, do a dry run and check how it looks on camera. 9. 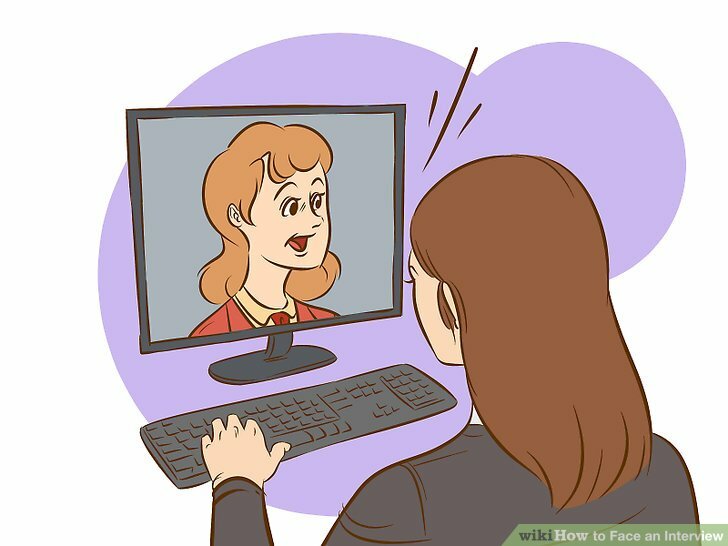 If your webcam allows, have it so that you can see what the person on the other end is seeing. That way you can notice if you start to slouch or something similar. 10. Arrange the camera and windows so that the parts of your screen where you will be looking are as close as possible to one another. The idea is to look into the camera, or at least look like you are. If you are looking at a video window or reference material on your screen, you may be looking up or down, past the camera. 11. Don't over-prepare. Know what you want to say or at least have a good idea. If you are reading something, or referring to notes, it quickly becomes obvious. - If you do want notes, or other items, make sure they are at hand. Don't run around getting them after the interview begins. 12. Don't use a swivel chair. As the interview goes on, you may get restless or nervous and will start to rock in the chair.